If you play golf and love the game, at some point you will notice a loss in distance. Usually, this is due to age, just getting older, losing flexibility and strength. Over years, many golfers just don’t realize how much distance they have been losing, because over time, they have been making adjustments to their equipment, changing shafts, finding better club technologies and switching golf balls designs. Ultimately, the loss of distance reaches a point where the golfer gets discouraged and starts to seek answers. Get your swing analyzed with computer video and fix your flaws. Sometimes, players just have bad technique and are giving away distance. A lot of recreational players that don’t have good golf fundamentals will notice a larger drop in their distance as they get older, because they have learned to use non-fundamental power sources to create speed. Look at older players like Tom Watson, who still generates lots of club speed even at age 68 and is still competitive on the PGA Tour. Watson obviously has a good golf swing, but he swings with tempo, uses his legs and hips as well as his arms to create speed. Most recreational players never learned to use their hips and legs properly in the golf swing, and this flaw becomes very noticeable with age. TIP: Learn to use your hips and legs properly in your golf swing to create more speed and distance. Get your club speed, ball speed and launch data analyzed on a launch monitor to make sure your clubs are correct for your speed. One of the best things you can do as a golfer is to get your club speed, ball speed and launch data analyzed at least once a year if you play golf on a regular basis. Ultimately, it all comes down to physics, and if you don’t have the correct equipment, you are at a huge disadvantage as it relates to distance. Based on how fast you swing, the ball speed you create and how you launch the ball, you need equipment that matches your abilities to get more distance. TIP: Check your club speed, ball speed and launch data at least once a year if you play golf on a regular basis. Start a golf-specific fitness and stretching program to help your body swing faster. Your body is an incredible thing. You will be surprised how just a little effort in working on your body will have amazing results in your golf swing and the ability to generate more distance. Many people don’t understand that your legs have a critical role in the golf swing, much like jumping. When you jump, you use the big muscles of your legs, your core and parts of your body that need to be strong and flexible. I have a great little drill that I offer to clients that anyone can do. Just sit in a sturdy chair, cross your arms across your chest. Using your core and your legs, just stand up, sit back down and repeat 8-10 times. Try to sit down slowly to keep your legs engaged. This exercise really helps use your legs and core, which will help your golf swing. 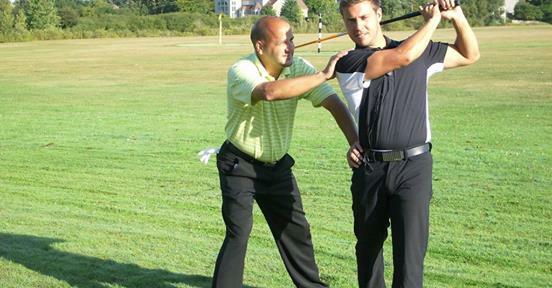 TIP: Start a golf fitness and stretching program. If you have medical conditions, please speak with your doctor first before starting any fitness program. If you are one of the millions of golfers that are struggling with losing distance, make sure to get your swing analyzed, have your equipment checked and start a simple golf fitness program. You will be on your way to more distance in no time. Arlen Bento Jr. is an award-winning golf coach, “Top 100” world-recognized golf instructor and club fitting expert living in Jensen Beach, Florida. He operates his own indoor golf academy in Stuart and is the co-host of Golf Talk Radio on WSTU 1450 AM. You can listen to his radio show on Wednesday evenings from 6-7 pm, or watch online at www.golftalkflorida.com. Arlen can be reached for instruction at (772) 485 8030, by email at arlenbentojr@gmail.com, or on his website www.arlenbentojrgolflessons.com.